Artificial intelligence is certainly a hot topic at present, unnerving some and exciting others. 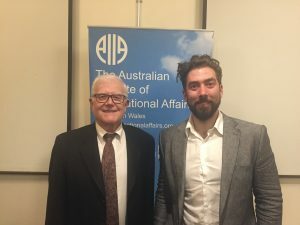 On Tuesday 7 August, the AIIA was treated to an intriguing talk on the topic by Alasdair Hamilton, partner and Chief Technology Officer at Remi AI (an artificial intelligence research firm). Alasdair illuminated what the current capabilities of AI are around the world, how it has been used to improve the lives of ordinary people, and the very real threats posed by this developing technology. Alasdair also provided insight into the various directions AI is taking and the numerous challenges this will pose to both lawmakers and wider society. A central notion of Alasdair’s which underpins the work of Remi AI is that a ‘hype-cycle’ exists surrounding the idea of artificial intelligence, driven by media exaggerations and sensationalisation. This has resulted in inaccurate public perceptions and unnecessary fears surrounding AI and a general misunderstanding of where the technology is currently at. Fears of AI reaching or surpassing human intelligence will not need to be addressed for about 20 to 30 years. The focus on this eventuality is detracting from attention on the very real dilemmas the world is facing at present regarding the impacts of artificial intelligence. Three key issues were outlined by Alasdair. The first is the potential for the manipulation of mass data collection sets for political purposes. He stressed that this must be addressed through regulation at a governmental level and by social media platforms, not at the level of individual AI companies. Second, Alasdair underscored the need to ensure that image recognition and general personal recognition is heavily monitored; there are currently no regulations surrounding this in Australia. The third issue that Alasdair identified as requiring urgent regulation is the impact of defence research into AI applications, specifically regarding lethal autonomous weapons. Alasdair stressed that this is of utmost importance to ensure that a new kind of arms race is prevented, as lethal autonomous weapons could give non-nuclear states capabilities equal to, if not greater than, those of nuclear states. In western countries, AI research was mainly being conducted by the private sector, while in China there was massive government involvement. In response to questions, Alasdair discussed the real-life applications of artificial intelligence, for example in finding the optimal strategy for managing transportation incidents. On concerns over the collection and utilisation of health data, particularly relevant to the MyHealth debate taking place in Australia, Alasdair emphasised the importance of protecting individuals’ health rights and using data responsibly and with consent. This will assist in solving many health conditions and diseases through improving the ease of detection. Overall, despite making ominous warnings about the pressing need for regulation of artificial intelligence’s potential in certain domains, Alasdair shared his enthusiasm for the potential of AI. His personal view is that through using AI to find tools to develop their own mechanisms, essentially ‘inventing a tool that can invent its own tools’, we will ultimately accelerate improvement of the human condition.